Last week I finished smoke-shaped forest, which continues a series reflecting on the simultaneous gains and losses associated with 200 acres of land being cleared adjacent to my parent’s property outside of Charleston, SC. In such cases waste wood and plowed stumps are often stacked up and burned, and they create an eerily beautiful sight at dusk in that thick southern air. 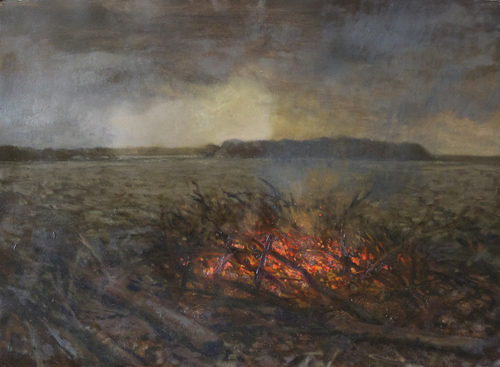 Anyone who has ever sat around a campfire knows the seduction of staring into the coals, a kind of primal reverie of thought and thoughtlessness, comfort and fear, and the clear insistence of a light in the darkness. broadleaf plantain with clover is the first in what I believe will be a series of edible wild plant paintings, most of which can be quickly located in urban environments. These are works about the act of foraging, which is another way of seeking a depth of experience outside of the dominant culture. But they also raise questions regarding patterns of recognition and the problems associated with the indirect transfer of knowledge. One of the classic problems of depicting plants is the method of depicting a “representative sample”. That is, the collection or photographic documentation of a single plant does not account for the inevitability of variation, and this creates a reservoir of doubt. Paintings are effective in communicating some types of specificity, but often at the expense of others. The payoff of this more “scenic” method, in my mind, is that it describes more fully a set of relationships within a given habitat. And just as my front lawn establishes criteria for fruitfulness, so does the limited context of my panel. 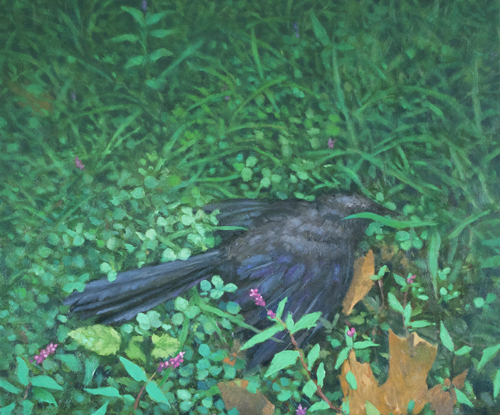 grackle with smartweed and clover keeps up the thematic approach to ground-cover, and the act of looking down as a move out of the demands of the body and into the life of the mind. Because the bird’s eye is denied to the viewer as a point of reference, the grackle straddles a space between life and death. 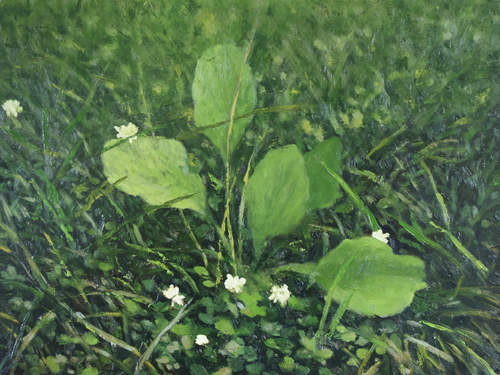 This entry was posted in edible wild plants, painting, Uncategorized and tagged broadleaf plantain, Charleston, cleared land, clover, edible wild plants, grackle, ink, landscape, oil, representative sample, SC, shellac, smartweed, smoke, smoke-shaped forest, South Carolina on May 8, 2012 by johnsarra. Last week I spent a morning in the Study Room at the Saint Louis Art Museum soaking up a few of the accomplishments of Zha Shibiao, Dai Xi, and Lu Yanshao. Lu’s album of landscapes was particularly significant to me, and provided a serendipitous escape from the frustrations that I have been facing in my own ink paintings. The paintings in the album alternate between monochromatic and colored works. And while there is an element of consistency, each piece manages to shift mood and focus in an unexpected way. By the time I had worked my way through the painting of Dai Xi and the calligraphy of Zha Shibiao I was convinced that the energy and precision of the painted line was the critical ingredient missing from my own work. As much as I love the flowing washes, they are air with no stone and flesh with no bone. So I decided to get back to that line, and to clarity. The previous weekend I had spent some time in Forest Park with my daughter. While sketching by the water, I saw a feather that had gotten caught in a spider web among the reeds. It became a natural weather-vane, pointing out the wind’s direction but never following along. Although I made a short video of the event, I prefer the natural stillness of the painting. In describing the feather’s arrested motion over time, the video describes the presence of the otherwise invisible web. The still image locks the feather into the center of its gaze where scrutiny of the object precedes explanation of the scene. 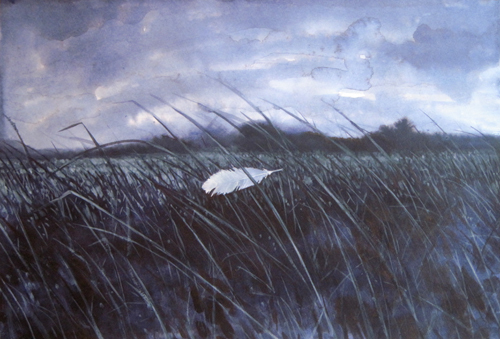 I transported the feather (by way of imagination) to the South Carolina marsh that I love so much, where the pulse of the tide takes the place of the shifting wind– known best by its presence or absence, not by the activity of transition. This entry was posted in painting and tagged Dai Xi, feather, ink, landscape, line, Lu Yanshao, marsh, painting, South Carolina, tempera, tide, wash, Zha Shibiao on September 23, 2009 by johnsarra.